warlock | That Was an Accident! Or, “How Ignitine Unexpectedly Took Over WoD.” Don’t remember Ignitine? She’s the one who likes bad hats, blew up a microwave FOR SCIENCE and manipulated Esplodine into trapping herself in the AH. All around good sort, really. This entry was posted in For the Horde, Baby!, Goblins, Ignitine, World of Warcraft and tagged goblins, ignitine, oh the goblinity, that's probably not good, warlock, wod, world of warcraft on February 10, 2015 by Prinnie Powah. 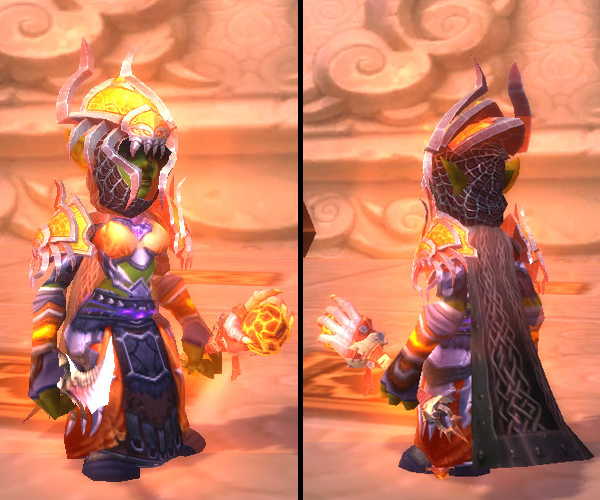 Previously on “ROY G. BIV Transmog,” our intrepid transmog team had a difference of fashion sense, a dramatic reveal of truth, and a scene in which Prinnie rolled over and admitted Warlock Logic is the Best Logic. Later, Prinnie learned that greedn is good, and that really, warlocks never change – pretty much ever. Ignitine: So, this is the last one. Are we gonna have to have a conversation here? You know, about my motivations or something? The composition of my choices? The fact that I dress LIEK WARLOCK instead of taking the competition into account? Prinnie: No, I really think it’s better if we don’t. At this point, reality’s settled in. Surreality? Something. Ignitine: I just didn’t wanna waste your time, since I’m gonna go all out. After all, it’s easier to ask for forgiveness than it is to ask for permission! If I wanted to, that is. Prinnie: I’m not sure I’m ready. Let me climb under my desk real quick. Prinnie: … what was that sound I just heard? Was that my soul breaking? Ignitine: Oh, that? Yeah, that’s normal. You get used to it. 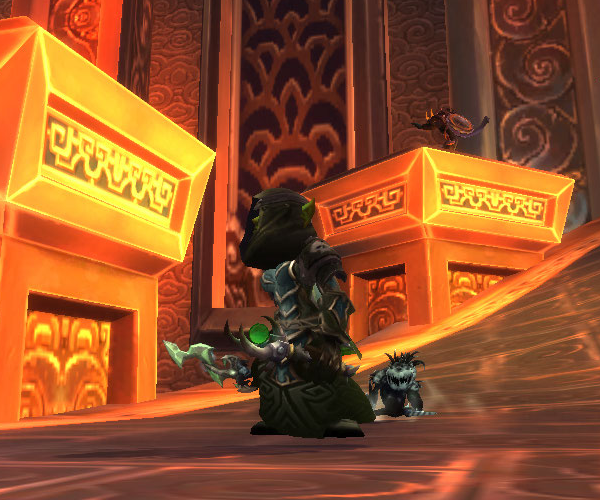 Thoughts: And thus, the “ROY G. BIV Transmog” series concludes with the biggest, freakiest hat Ignitine could find. Sure, it’s not the most violet-y, purple-y hat out there, but the violet accents it has TOTALLY COUNT. Well, they count enough for a certain warlock with highly flexible standards. I’m sure you’ve noticed that I’ve been somewhat absent from blogging and the game in general. I haven’t had as much time to play recently, and as a result, this rendition of the outfit isn’t exactly what I envisioned. It’s not the exact cape or off-hand I wanted, but it’ll have to do. I dunno about you, but what with the new expac now in beta and all, most time spent in Azeroth seems like a waiting game occupied mostly by the “MOAR CLOAKS” Project. What’re you in here for? Runestones. I need them all. What’re you in here for? Secrets. Do Secrets drop in here? What’re you in here for? Do these bosses drop Runestones? What’re you in here for? Don’t ask. Just don’t ask. This entry was posted in Cloth, Goblins, Ignitine, OMGWTF, Transmog, World of Warcraft and tagged belt of the falling rain, blade of the unmaker, bloodsoul raiment, cloak of seething hatred, cloth, consortium boots, gloves of broken fingers, goblins, hood of the horned nightmare, ignitine, mantle of the horned nightmare, mystifying charm, oh the goblinity, the roygbiv tmog contest, transmogging, warlock, world of warcraft on July 18, 2014 by Prinnie Powah. 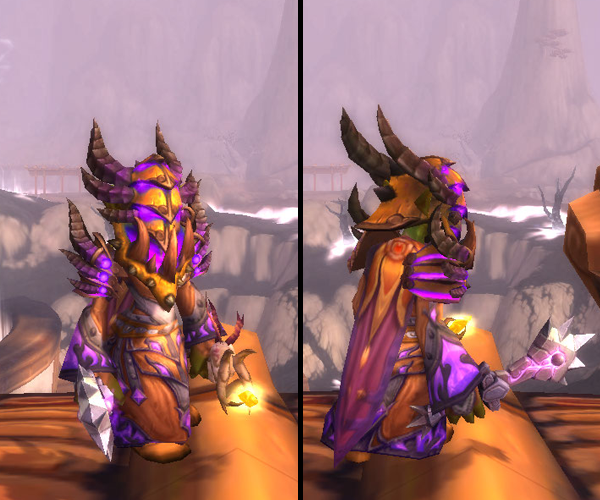 Previously on “ROY G. BIV Transmog,” our intrepid transmog team had a difference of fashion sense and a dramatic reveal of truth, and a moment in which Prinnie rolled over and admitted Warlock Logic is the Best Logic. Prinnie: I’m waiting for the other shoe to drop here, you know. Ignitine: But I’m wearing both of them. Prinnie: That’s not what I mean! I’m just sayin’, it looks like you’re plotting something, and I just don’t think it’s going to end well for anyone. Ignitine: My plots always end well for me, though. Prinnie: Where’s Esplodine? She’s a fashionista! I should get her to do this month’s contest. It would be safer. 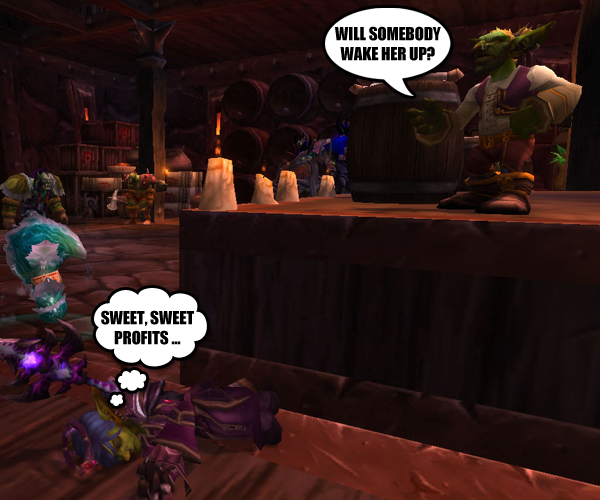 Ignitine: Oh, I sent her a bunch of greens and told her to put them on the AH for great profit. She doesn’t use any sort of AH addon, so we won’t be seeing her for awhile. Don’t wanna wake up ’til it’s real. … aaaaand now that I’ve thought of “fel green” as nuclear snot green, I can’t unsee this mental picture I have of green fire actually being gobs of irradiated mucus, sneeze-hurled from the sky by some giant, invisible nose. If you can’t shake the image now either, you’re welcome. One finally agreed to go home with the goblins. 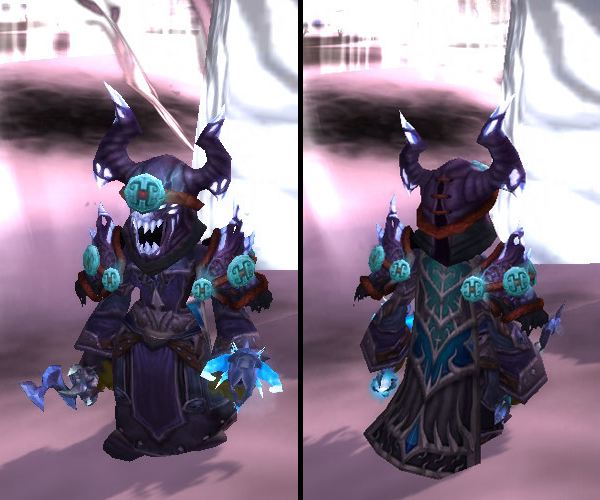 This entry was posted in Cloth, For the Horde, Baby!, Goblins, Ignitine, Transmog, World of Warcraft and tagged conjurer's shoes, festering primordial globule, gladiator's dreadweave gloves, gladiator's dreadweave robe, glyph-lined sash, goblins, ignitine, midnight sun, oh the goblinity, savage gladiator's felweave amice, savage gladiator's felweave cowl, swamplight cloak, the roygbiv tmog contest, transmogging, warlock, world of warcraft on May 10, 2014 by Prinnie Powah. Previously on “ROY G. BIV Transmog,” our intrepid transmog team had a difference of fashion sense and a dramatic reveal of truth. Prinnie: Y’know, Ignitine, if I didn’t know any better, I’d say you were trolling me. First you go tentacles, then when I’m expecting tentacles, you go normal. Well, “normal.” For you. Prinnie: Point taken. Have at it. 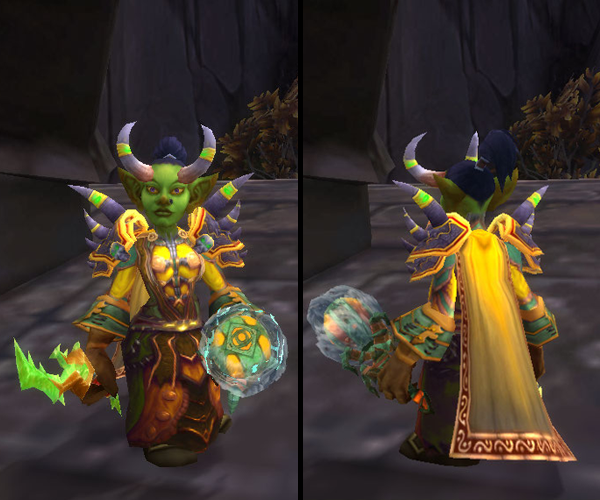 Thoughts: If, as a clothie, you want to avoid the obviously YELLOOOOOOW choices (Robes of the Battleguard, anyone? ), then it gets a bit challenging. Ignitine assures me this is not her “green” submission, because if she wanted to wear green, she would be wearing green, and she knows green because she is green, dammit. No, her green submission is greener, therefore, this is the yellow one. As a side note, all these dang sources (Icy Veins, Mogit …) keep telling me that warlocks can get the Pandaland offhand lanterns, like the Safari Lantern, but they’re wrong. The Safari Lantern has spirit on it, which means that a purely DPS class like warlock can’t get it as a quest reward. This makes me sad. This is actually my favorite outfit of the year so far. 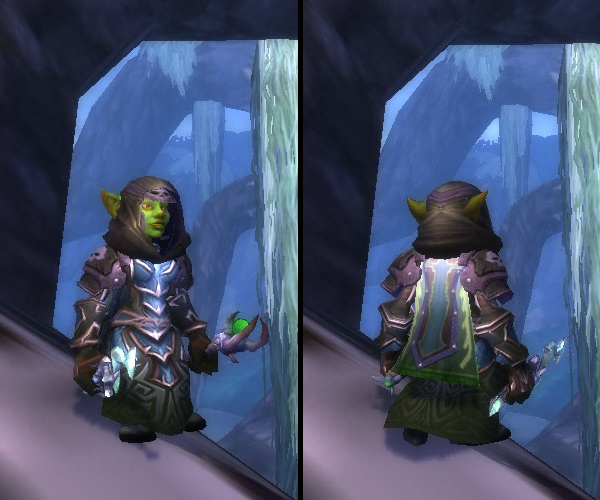 This entry was posted in Cloth, For the Horde, Baby!, Goblins, Ignitine, Transmog, World of Warcraft and tagged cloak of the hardened tortoise, cloth, councillor's gloves, felheart shoulder pads, goblins, horns of the left hand path, ignitine, oh the goblinity, regail's crackling dagger, sandals of ritual, sash of mortal desire, spelltwister's grand robe, the roygbiv tmog contest, tornado-summoning censer, transmogging, warlock, world of warcraft on April 4, 2014 by Prinnie Powah. 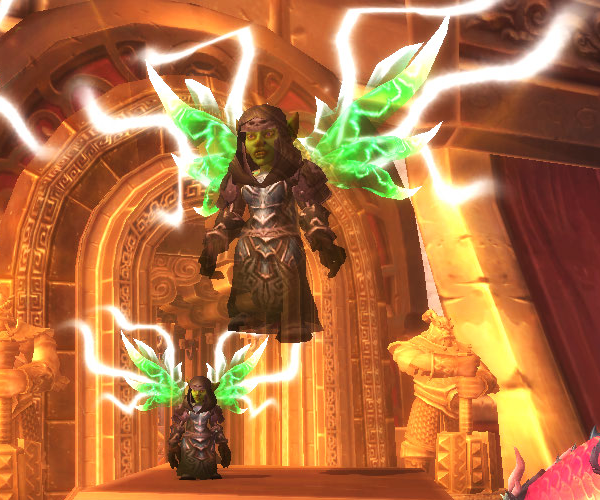 Previously on “ROY G. BIV Transmog,” our intrepid transmog team had a difference of fashion sense. Ignitine: (interrupting) You’d better let me represent, dammit! Prinnie: I dunno, you kinda effed up the last one. I mean, tentacle monster? If I let you do this, you’ll just make another tentacle monster. Ignitine: You’ll see. If you don’t let me, I’ll burn everything in Void Storage!! I swear I will! Prinnie: Yeah, like threatening me is going to get you into the contest. Let’s be honest here – your chances are slim. Ignitine: Honest? 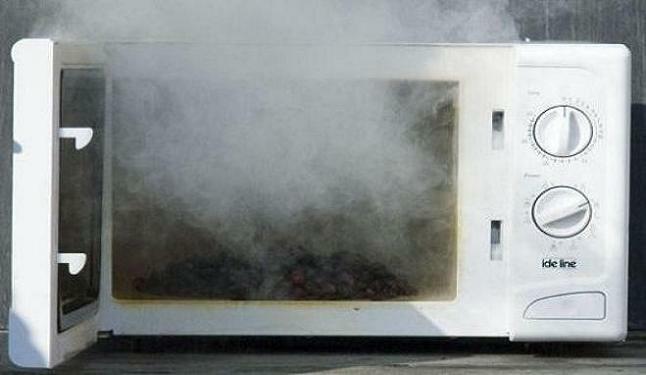 Okay fine, I promise never to put tin foil in the microwave again. Ignitine: It was For Science. Prinnie: I just … I just don’t even! ALL THE SMOKE AND DRAMA. Ignitine: She’s distracted! THE CONTEST ENTRY IS MINE. Ignitine: You thought I was gonna do tentacles again, didn’t you!? That’s right! You thought you knew me, but you were wrong. Thoughts: Fiiiiiiiiiiiiiiiiiiiiiiiiiiiiiiiiiiiiiiireeeeeeeeeeeeeeeee Yeah, that’s about how deep my thoughts are at this exact moment. This entry was posted in Cloth, For the Horde, Baby!, Goblins, Ignitine, OMGWTF, Transmog, World of Warcraft and tagged balespider's hood, balespider's mantle, belt of false dignity, boots of ethereal manipulation, cloth, gilded thorium cloak, ignitine, incanter's gloves, juggernaut's power core, knife of incision, oh the goblinity, silk robe of eminent domain, the roygbiv tmog contest, transmogging, warlock, world of warcraft on March 12, 2014 by Prinnie Powah.